I’ve been working on my presentation to the graduates of Syracuse University’s Masters of Science and Communications Management program. The University is holding it’s reunion this coming weekend and I’ll be presenting on PR 2.0 and the state of the industry. Part of my presentation discusses the results of the Vocus survey, “PR Planning in 2010.” I participated in a Vocus Webinar in November 2009 and wrote about some of the findings just after the event. 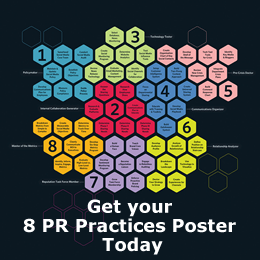 I wanted to share with you a few more of the thoughts from the 1,800 PR and marketing professionals (who participated in the survey and who perform PR functions), with respect to their roles in 2010. I was very happy with the response to the statement: In 2010, PR’s role in the marketing mix will (a) become more important, (b) stay the same or (c) become less important. Approximately 64% of the survey participants stated that their roles will become more important, about 33% said that the role will stay the same and only 3% stated that PR’s role will be less involved in the marketing mix in 2010. This clearly illustrates a positive outlook with respect to how professionals feel about their roles and responsibilities moving forward in 2010. In my opinion, it appears that despite a tough year in 2009, in the eyes of the professional, the PR person’s role is more important now, and will be more integrated into the marketing mix. 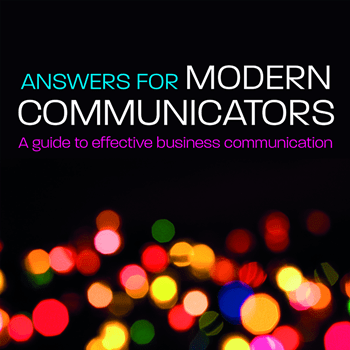 For me, it was no surprise that Strategic Communications, Corporate Communications and Public Relations ranked highly (above the 50% mark). However, it’s interesting to note that there’s emphasis on new roles including Content Management, Social Media Communications and Marketing Communications (showing more integration between the PR and Marketing disciplines). 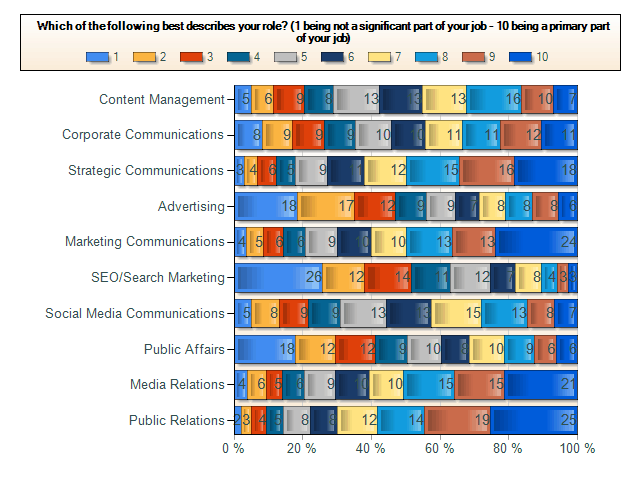 As a matter of fact, the second highest percentage appeared under the Marketing Communications category, with 24% of professionals ranking this area as a primary part of their jobs. 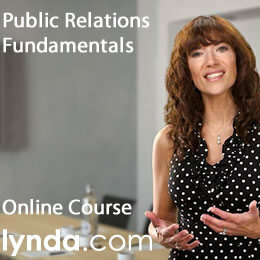 How do you see the public relations professional’s role in 2010 and moving forward in years to come? Are you in agreement with these percentages? And, how do you see PR roles and responsibilities increasing? 11 Responses to " Public Relations Roles in 2010 "
Marketing is about moving products; public relations is about creating and building upon relationships. As long as we believe we are somehow part of something called the “marketing mix,” we are lost as a profession. Public relations in the 21st century (if it is to survive as anything more than a Robin to marketing’s Batman) must be entirely about creating and growing our clients’ social capital. By social capital, I mean: The sum of the benefits that flow to any organization from the trust, reciprocity, information, and cooperation it receives from its social networks. Building trust, nurturing relationships, generating social capital … these are the purview of public relations. And they have nothing to do with marketing. Unfortunately, I had to recently cancel my trip to this reunion due to a number of other trips coming up and now I’m even more disappointed I won’t be making the trip. I graduated from the Syracuse program in 2004 and I know you will be engaged in a good discussion with this very smart group of professionals. Hi Allan, it would have been so great to meet you! I’m sorry that you won’t be able to attend the Syracuse reunion. I’m sure I’ll be doing another blog post about the event next week. I think it’s going to be a very interesting discussion and I’m really looking forward to this presentation! Thanks for commenting and hopefully we’ll have another opportunity to meet in the future! Hi Rusty, thank you for commenting on my blog post. Yes, I agree that marketing is much more about moving products and PR is creating and building relationships. As more companies integrate their communication outreach, we see more collaboration between marketing, web and PR departments, so that brands can keep on par with consistent communication and all disciplines working together support a brand and help the brand to achieve its business goals. I think that the survey was pointing out that PR will be more in collaboration with marketing and digital communications, not performing a marketing function. I absolutely agree that public relations in the 21st century is about creating and growing a brand’s social capital. Knowing how to nurture and grow a relationship through trust and having a reciprocal relationship has always been a strong suit for PR. Hi Stephen! Thanks for commenting on my blog. It’s very interesting to see those statistics and, as for social media, that’s a great question. I think there were PR people as early adopters, realizing that social media was, in fact, one of their core responsibiities early on. However, depending upon the industry and the brand (as well as the organization’s structure) different groups within a company may have initiated social communications before PR realized that it naturally should be an integral part of all company communications. However, there is no real ownership of social media. Similar to email or IM ….no one owns them, but we all play a very important role. I believe in 2010 and moving forward the public relations professionals will assume this role within their organizations and continue to build very strong relationships and value through social media communications for their organizations. 😉 True! 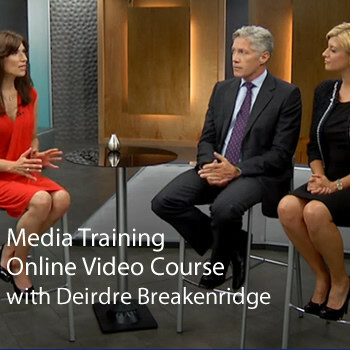 Thanks Deirdre. Let’s see how this evolves!